Here at Hertfordshire Sports Village we genuinely want you to have the best experience you possibly can when you come here. We care if you meet your goals or not. That’s why we want you to make the most of your membership! In order to do that we promise to ensure every member will get a free full induction in the gym, using our new state of art fitness tracking software with Matrix. Every member will also get a personalised program, designed using our new BLAST Card format. 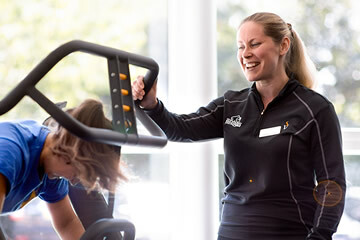 On top of that you will receive a free 30 minute PT session with one of our highly qualified trainers. And then you will have unlimited access to the innovative BodiTrax machine which monitors and tracks your body composition, so we can see the progress you make step by step. We don’t want to just give you a program and send you on your way, we want to prescribe the best possible way for you to achieve your goals and enjoy it in the process. Hi there my name is Nick and I would love to help you on your journey towards your fitness and health goals! 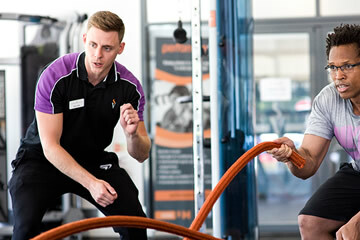 I have over 18 years’ experience within the field of Health & Fitness, including 13 at the SV and I am sure that I can help you reach your targets and keep you motivated to exercise here at Hertfordshire Sports Village. Whatever your goals be they to lose weight, feel better about yourself or improve your strength levels I can help you to achieve these through hard work and determination to get there! I am qualified with a BSc. Honours degree in Sports Science and Higher National Diploma in Sports Studies and I will support and also give you the nutritional advice you need around your diet to help you lose weight and take control to reach your goal weight. If you are looking to hit your goals and are not afraid to work hard to get there, then look no further as I can help you! I will work with you to set realistic goals and make sure you achieve them during our 1-2-1 PT sessions. If you have fallen short in the past and are struggling for motivation then contact me today and together let’s help you achieve! I am a recent UH graduate in Sports Therapy and due to start a masters in Physiotherapy in 2017. I have been a qualified Gym instructor and Level 3 Personal Trainer for the last 6 years. My philosophy focuses on enhancing the wellbeing of clients by empowering them with the knowledge, skills, support, guidance and resources to assist and inspire them on their journey to a healthier life. Motivated by appreciation and gratitude, I prosper in helping individuals get the most out of what they are training for. Whether it be sports conditioning, body transformations, recovery from an injury or illness, I have a wide range of knowledge that can help a large proportion of the population. 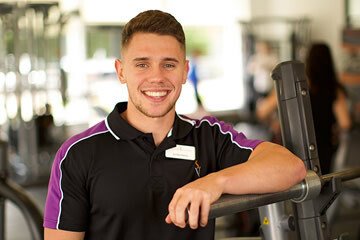 Approachable and always happy to help, I can be found on the gym floor and also in the gym training throughout the week. I took my first steps into a gym over 12 years ago and after noticing results I was hooked, I had the bug. In seeing I could make a difference to myself I knew I could do the same for others so I decided to take the leap and change my career path. Nearly 10 years later I have expanded my knowledge and developed a style in which the sessions I deliver are both challenging and enjoyable. I understand that everyone is different and has different goals so every session is specific to the individual whatever your goal may be strength, endurance, weight loss or a total body transformation. I pride myself on getting people results and achieving what my clients may see as unachievable. I have been training myself for 8 years. I started after I had my son, because I wanted to lose weight. Hard training and good diet helped me to lose 30 kg. At that time I discover my passion for fitness. I recently done my Personal training qualification to be able to help people reach their goals and because I really enjoy to train people and just love my job. Nothing makes me happier than seeing my clients achieve good result. Personally I enjoying weight lifting and long distance run to keep me fit and change my physique. Most of the time when I’m not working you will find me in the free weight area or on treadmill. I am also a qualified spin and Mossa Power Instructor teaching regular classes, so if you fancy a challenge away from the gym floor come and join me in the studio. Hi, my name is Coral and I am passionate about Health and fitness and helping my clients reach their full potential by achieving their goals. I personally enjoy strength training and am going to compete in both bikini and fitness competitions this year. This being said, I am a versatile trainer who works with clients of all abilities and can personalise your workouts to reach your goals, whether they are to lose weight, increase strength or become more functional. As a personal trainer I do not only see myself as someone who can help you improve physically but I also want my clients to build confidence, knowledge and understanding with both fitness and nutrition. I have recently completed my Level 3 pre & post natal qualification which means I can also help women continue to train throughout pregnancy. Since then I have continuously worked on my own development to make sure I am up to date with the latest fitness trends and made sure my clients are only receiving the best training. Leo is a Level 3 Recognised Exercise Professional from Buckinghamshire with a specialism in strength training and injury prevention. He has a degree in Strength and Conditioning and is a Certified Strength and Conditioning Specialist. He has spent the last three years working as a Strength and Conditioning Coach, with experience in professional rugby, university sports and school sports with athletes aged 12 to 40 years old. He currently splits his time between the Hertfordshire Sports Village and St Albans School, where he is the lead Strength coach. When he isn't coaching or in the gym, you'll find him socialising, cooking or engaging in other sporting activities. I am passionate about fitness and get a kick out of helping people achieve their goals, whether that be losing weight, sorting out your head, regaining your general fitness or recovering from illness. I don’t shout and I’m not a fitness freak, I will work with you to push you out of your comfort zone, but in a way that makes you feel motivated and supported. I make every session fun and enjoyable, challenging but doable, increasing the difficulty each time to ensure you get the best out of it. I particularly enjoy working with people who may find the gym intimidating. So, if this is you, get in touch! I will help you overcome your fear and make you feel comfortable and at ease. I love training outdoors, whatever the weather, with boot camp style sessions including HIIT, OMEM (on the minute every minute) and the more traditional circuits. All sessions will be tailored to individual needs but that doesn’t mean cutting out the exercises you don’t like! If individual sessions are too expensive or you prefer to work with a friend, I offer small group training - share the cost but more importantly share the journey.